Left - Standing in AR, TX, and LA. F – 3am treadmill 20:42. 1PM 4 with Eric outside of Little Rock 30:37. 4PM at Magazine Mountain 59:24. 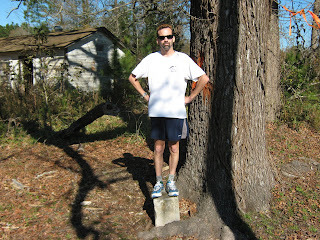 Sun – 7am run o/b at Hot Springs county high point 45:12. 11am – o/b in Hot Springs National Park 1:02:40. Is that Mike Beeman's house in the background? Looks like they fixed it up. We must have used that line about 50 times on the trip. It got funnier every time.